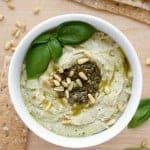 Basil Pesto Hummus is an easy to make chickpea dip that has classic pesto ingredients blended in, making it a fresh and flavorful appetizer! Put all of the ingredients in your food processor and process until smooth, scraping down the sides as necessary. Serve with toasted bread, crackers, chips or veggies for dipping.